Uglyworld #666 - Underground Exploration, originally uploaded by www.bazpics.com. As we reached the end of the Southward end of the lava tube the tunnel suddenly went from being around 15 metres tall to 2 metres tall and then down to nothing more than a crawl space. Babo was the only one brave enough to travel into the crawl space, as around 30 visitors to the cave all stood waiting to hear what he found. 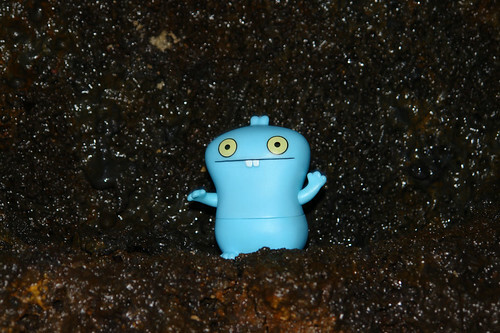 As he returned to the start of the crawl space everyone held their breath waiting on his words of wisdom, to which Babo stood up (as you see here) and stated, "Sorries everyone, there is no cookies there! ".